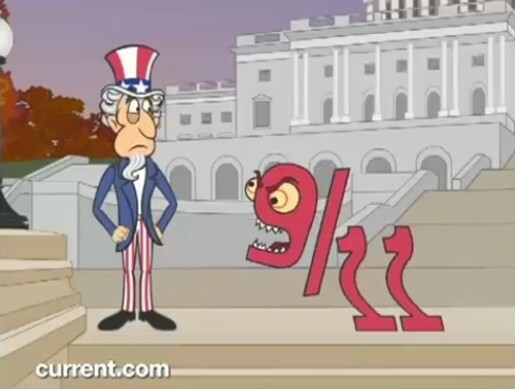 Uncle Sam appears to be developing a mature approach to the events of 9/11, 2001, if the SuperNews! treatment is anything to go by. Uncle Sam is busy telling us how the United States is getting on with living safely when he’s rudely interrupted by 9/11. However, Uncle Sam does not succumb to 9/11’s attempts to create an environment of fear. What follows is a dialogue that explores healthy and unhealthy responses to terrorist attacks. Listen out for the reference to Budweiser being produced in Belgium. Supernews, a short form animated television series airing Current TV, focuses on political humor and satirical treatments of popular culture. The SuperNews on 9/11 spot was put together by writer/director/producer Josh Faure-Brac, animator/character designer/producer Stephen K.L. Olsen, writer Jonah Ray, senior animator Dustin McLean, animators David Johnston and Andre Nguyen, lip sync artist John Sousa, sound designer Martin Carillo, with opening theme by Ghetto Blaster. Voices are Rowell Gorman and Josh Faure-Brac.